Győr, 29 October 2018—as of 1 November 2018, Thoralf Hanschel will be the Member of the Board of Management of Audi Hungaria for Engine Construction. He will take over Herbert Steiner’s position, who has been leading the Department of Engine Construction since 2014. Thoralf Hanschel came from Wolfsburg, where he was responsible for production planning at the component manufacturing department of the Volkswagen Concern. “With his all-round expertise, Herbert Steiner has contributed to the success of Audi Hungaria a great deal in the past four years. Just one example: the Company successfully launched the serial production of electric engines under his management. And this was the beginning of a new era”, Achim Heinfling, Chairman of the Board of Management of AUDI HUNGARIA Zrt said. “Thoralf Hanschel will continue this success story and ensure continuity as well. 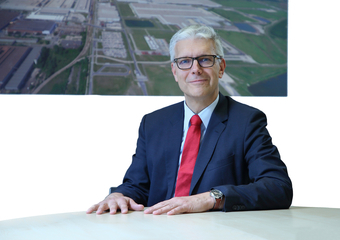 His professional competence and experience are a guarantee for the further success of engine construction and the implementation of further technological innovations”, Achim Heinfling highlighted. Thoralf Hanschel was born in 1964 in Wolfsburg, Braunschweig, Germany, and graduated as a mechanical engineer at the University of Waterloo, Canada. He works at Volkswagen AG since 1991. He was responsible for the international development of engine design since 2000, including factory planning, planning processes of each brand and region within the Volkswagen Concern, as well as the central management and standardization of processes. He took over the global planning processes at the component manufacturing department of the Volkswagen Concern in 2016. In the future, Thoralf Hanschel will take over the position “Member of the Board of Management for Engine Construction” from Herbert Steiner, who will be responsible for the management of the Engine and Foundry Department in Wolfsburg, at Volkswagen’s component development and manufacturing department. Herbert Steiner played an important role in launching the serial production of electric engines this summer. At Audi Hungaria, one of the world’s largest engine factories, about 6,000 employees manufacture more than 8,800 engines a day, for the 32 vehicle production sites of the Volkswagen Concern. More than 34 million engines have been manufactured during the Company’s 25-year history so far.